Chris Emanual - Artist - "Our Belize Vacation"
I would like to introduce to you, Chris Emmanuel. 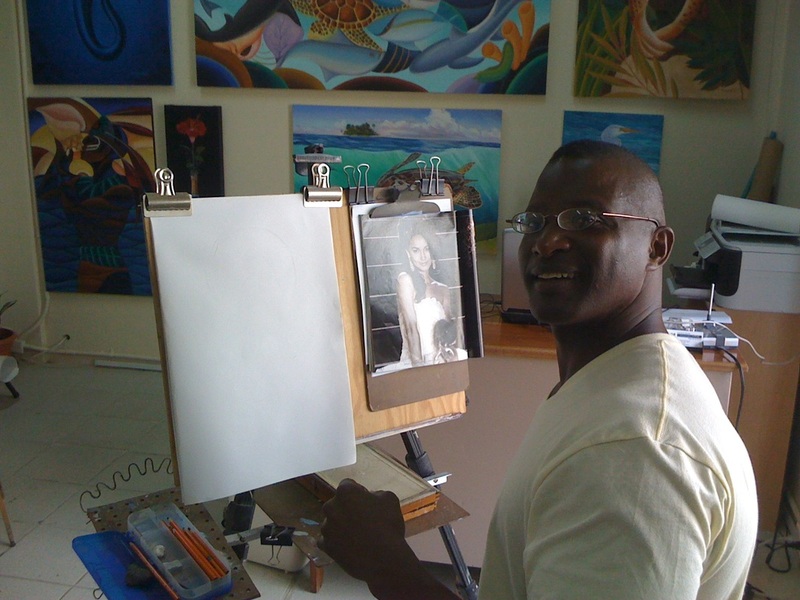 Chris owns an art gallery located in the Sunbreeze Hotel, across the street from Tropic Air. 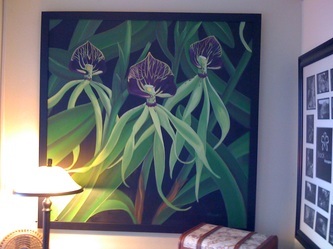 Chris is the one, that painted the large black orchid painting (below), that many of you have seen hanging on the wall behind my desk. 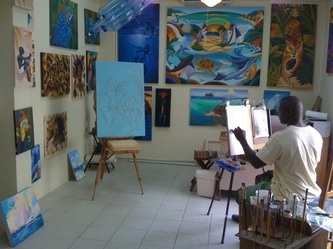 Chris was born in Tropics in 1960, and was part of a family of five, His artistic talent was apparent at the age of three, as noted by many of his family members. As a young boy he excelled in music, dance, drawing, painting and writing poetry. His father dove for conch shells to support the family. After graduating, Chris went on to study graphic design and creative writing. He entered the work force to pursue his love of the theater, modeling and graphic design, although unsatisfied with these careers. He later decided to pursue his dream and intense love of art, in becoming a full-time artist/writer. Traveling to San Pedro, Belize, on holiday, Chris fell in love with this small fishing village, consisting of a mixture of cultures, sand, sea, and the barrier reef. Deciding that San Pedro (Belize) would be his new home, he opened up his art gallery and has written numerous well-known inspirational books, that this island has come to cherish. His paintings and writings reflect his feeling of being connected to nature - his books/paintings, explore the tropics with colorful abstract shapes of people and wildlife, entwined in perfect harmony. Any of Chris's paintings can be rolled into a tube (ready for travel), to take with you when flying back home. They make a great gift for someone special.